While pondering the meaning of Thanksgiving over this long weekend, I realized that thankfulness is a powerful motivator for good. I also realized that thankfulness often leads to dead ends. Yes, we’re thankful for family, friends, iPods, a job, etc., but how often do we only spend time/money in our own little worlds, not reaching out and becoming agents for creating a better world? 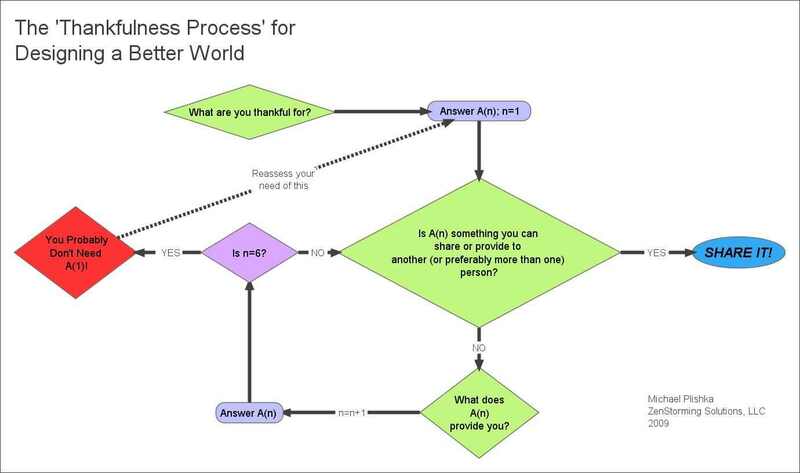 To that end I propose the above depicted model for developing a ‘Thankful World’ filled with relationships and innovations that go beyond personal consumption – a world in which we we’re concerned about more than ourselves. Generally, it works by peeling away our personal likes to realize the deeper human needs and motivations of ourselves and hence the many. Specifically, it’s simple: Ask yourself what you’re thankful for. Ask if you can provide it to others. If you can, do it. If you can’t, ask yourself why what you’re thankful for is important to you. Do this until you find something that you can provide to others and then do it. 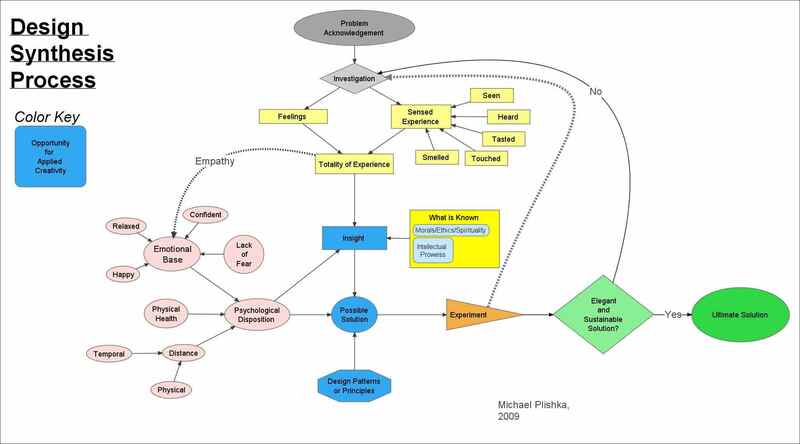 The model also includes a limiting aspect loosely based upon the 5 Whys to test the sustainability of our solutions. My reasoning is that if the object/subject we’re thankful for does not lead to philanthropic behavior after 5 rounds of introspective thought, then it’s quite possible that what we’re thankful for might not really be needed in the first place. What do you think of this model? Could it lead to better social design? Could it lead to a better world? Could it lead to more pertinent and sustainable innovation? I was recently in a discussion about a do-it-yourself digital camera called the “Big Shot“. The main point of contention was whether or not this device actually helped kids learn about photography. Make no bones about it, the Big Shot definitely has an impact on kids – especially the inner city children that were able to try this out. The Big Shot is a great tool for getting children together, for giving them pride in what they build, for getting them to socialize, to share their creativity. Rock On, Big Shot!! However, with regards to actually teaching about photography, I’m not sure it hits the mark. Teaching should be R.A.D. ! Respect for the past – A do-it-yourself single shot camera kit that lets kids see film developing; A pinhole camera; A contact photograph of a leaf would all be instructive about light and how people took and still take pictures. Awe for the present experience – Build the Big Shot. Dreams for the future – This actually happens naturally when ‘R’ and ‘A’ occur. Ask them to dream based upon what they’ve experienced. When the R.A.D. process is followed, people (adults and children alike) see themselves as part of a continuum, not just techno-consumers. In today’s day, it’s too easy to see technology as a stand alone solution to our problems. Sure, technology can be helpful, but real solutions start in the locus between the ears and behind the eyes, the place where we bow respectfully to the past, get excited with awe about the present, and realize there is so much more that the future holds, and we’re all a part of it. Can Too Many People be Creative? According to this blog over at MIT, the answer is “yes”. Researchers broke down society into creators and imitators. Their task was to see what optimum amount of creativity is needed to benefit society through the dissemination of innovations. Turns out that if creators are doing their thing 50% of the time, and imitators imitating 100% of the time, approximately 30%-40% of the population should be creators, the rest imitators. As the quality of ideas goes up, less creators are needed. While it’s an interesting study and worthy of some pondering, three shortcomings bother me. 1. The study assumes all creative ideas are meant for sharing. In fact, most of our creativity isn’t ‘public’ but is meant for us personally-meant to make our own lives easier. Most ideas don’t get disseminated and hence don’t get built upon; nevertheless, these people are part of society and so indirectly improve society through their hidden innovations. 2. Each creative idea does not result in negative repercussions. Most solutions that get adapted result in unwanted consequences of some sort. This results in additional idea generation, often by others who at some earlier time were only bystanders (imitators) but could very well have been creators in a different realm. 3. The study assumes there is a portion of the population that is only imitating. I don’t think this is a valid assumption (see Point 1). While, I realize that this fascinating attempt to model the impact of creativity on society is not meant to be 100% accurate, if we apply this model to corporate cultures, we realize that only a small percentage of people in a company could truly be called creators -most are imitators and (gasp!) are expected to be imitators. Therefore, according to this model, those few creators in the company need to be amazingly brilliant and doing their creation the overwhelming majority of the time. But, given that the minutiae of day-to-day workings insidiously creep in on most people without their knowledge, those creators are probably not even working on creating as much as they should be (imitating?) and not contributing to the overall level of corporate fitness. The result (at least according to this model) is that most corporate cultures never reach their optimum level of fitness. This is something that, unfortunately, most people would not argue with. The name is simple, common. A google search of the name yields 69 million hits (mine yields 417,000). There is one Paul Smith that was anything but common. Born September 21, 1921, Paul had spastic cerebral palsy. He wasn’t able to attend school but his love of life propelled him into becoming a self-taught master in two things: chess and art. It’ s the art that truly is amazing. You see, Paul taught himself to use his typewriter as an easel. But he didn’t use brushes. … while the other hand held the typing hand steady. The typewriter was a pretty basic and common writing tool of the time, yet Paul didn’t use it to simply string letters into words. Actually he usually didn’t even use the letters of the typewriter, but instead used the @ # $ % ^ & * ( ) _ characters. As he became more familiar with the typewriter he experimented with colored ribbons and a technique whereby he created smudged shading on the paper by pushing against the ribbon with his thumb. What is even more amazing, is that unlike other paintings where things are painted over and changed as the painting evolves, Paul had to see the final work in his mind’s eye before he even started… and work one character at a time. Today we open Photoshop or some other graphic arts program, and occasionally even use pencil and paper. He placed a piece of paper in a typewriter, hit a character, readjusted the paper orientation, hit another character…. from the overflowing well of inspiration that bubbles and dances in each of us. Paul Smith died on June 25, 2007, but the lessons we can learn from him are timeless. Then there was the Tyco electric train set-up that I built in my basement in which I designed an entire world for my trains. The words are meant to be together. If you believe this, then check out this great design contest by Bombardier. Design a cool train interior and you may make yourself a couple thousand Euros , a netbook or a trip to InnoTrans 2010 in Berlin. …it also isolates and therein lies the problem. Do we want to be part of the world, contributing and living within it or would we rather do what we want, letting the world do what it may, while we stay safe and warm? Making a building into a creatively designed, self-contained world is great for its tenants but is this creativity and innovation really a good thing if it fosters separation of the inhabitants from the immediate community? Don’t get me wrong, people should be protected, but there’s an interesting situation here in that the solution is ultimately self-defeating. The Behance Network put together this interesting view on the future based upon the scenarios from the Institute for the Future. Some interesting perspectives, especially with regards to inter-species communication. On the other hand, some of the solutions posited, like fertilizing oceans with iron to capture CO2, are too current and thus not sophisticated enough to be included in a future in which digital body-swapping exists. Ever since I attended the Design Research Conference in Chicago, I’ve been inspired by Jon Kolko’s thoughts on Design Synthesis and decided to dive more deeply into the topic. After all, the better we can get a handle on the process of synthesis, the better we can (hopefully) reproducibly design innovative products, processes and communities. The flow chart that follows is my take on a process of design synthesis, influenced by Jon’s thoughts. I’ve incorporated it into a broader iterative process that also includes psychological influences. What are your thoughts on this? What would you change? What works for you? I’m looking forward to your input!